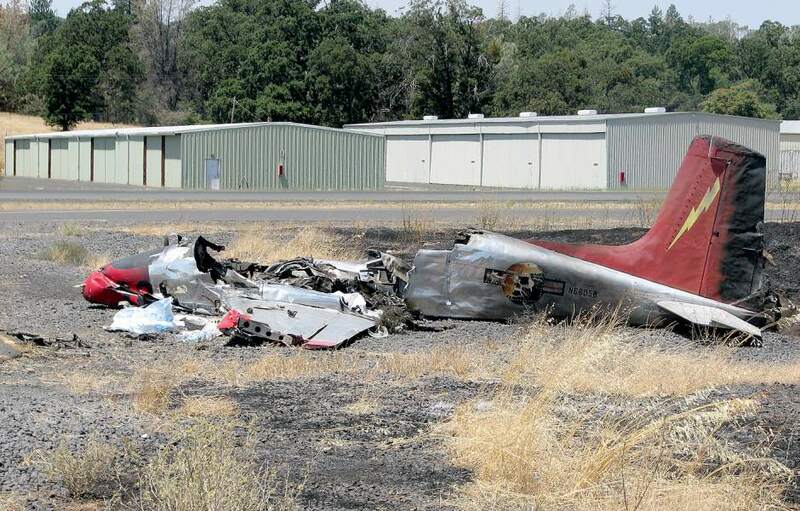 On July 27, 2016, about 1645 Pacific daylight time, a Cessna 310B multi-engine airplane, N6605B, sustained substantial damage following a loss of control during takeoff at Columbia Airport (O22), Columbia, California. The airline transport pilot and three passengers sustained fatal injuries. The airplane was registered to and operated by the pilot under the provisions of Title 14 Code of Federal Regulations Part 91 as a personal cross-country flight. Visual meteorological conditions prevailed and a flight plan was not filed. The flight was originating at the time of the accident, and the intended destination was Monterey, California. One witness, who was working at the air tanker fire base at O22, stated that, when the airplane initiated its takeoff roll, it was behind him, and he did not see the actual takeoff. However, shortly after the airplane lifted off, a fellow worker pointed the airplane out to the witness, and he then saw it in level flight and drifting to the left of the runway. It looked as if the pilot was trying to abort the takeoff and land on the taxiway; the landing gear was down, and both engines appeared to be running. The witness reported that the airplane was "slightly leaning left and drifting hard to the left" when the left main landing gear touched down, followed by the left wing impacting the taxiway. The airplane then slid to the left, going off the taxiway and into a helipad area before bursting into flames. A second witness, who was also working at the tanker fire base, reported that she observed the airplane perform its run up and then begin its takeoff roll. The witness stated that the Cessna lifted off, climbed about 50 ft, and then began to drift left over the grass between the taxiway and the runway. The witness mentioned that it was "obvious that there was something wrong" and that the pilot was "possibly attempting to land on the taxiway." The witness watched the airplane crash, come to rest, and catch fire. 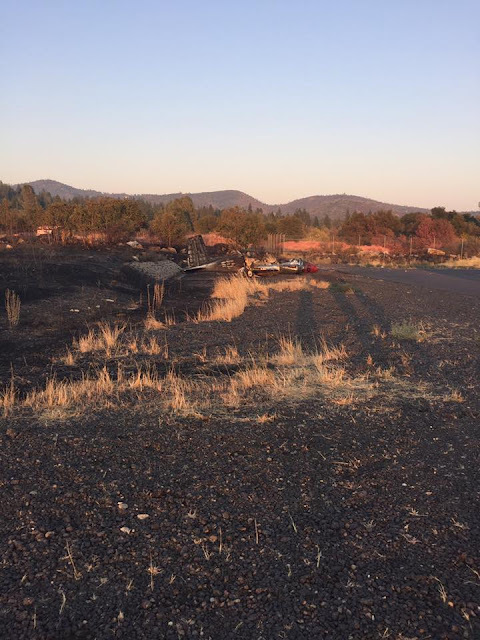 A third witness, the pilot of an air tanker that was parked and being reloaded with fire retardant, saw the airplane taxi in front of him and into position for a full-length takeoff on runway 17. The witness stated that he noticed that the airplane's right engine was shut down. The witness watched the pilot restart the right engine and then begin his takeoff roll about 10 seconds later. Due to his position facing northwest, this witness was only able to watch the first 200 ft or so of the takeoff roll, which appeared uneventful. A fourth witness observed the accident from his office, which was located about 835 ft west of and perpendicular to the centerline of runway 17 and about 1,300 ft northwest of the wreckage site. The witness reported that he initially observed the airplane about 40 to 50 ft above the runway taking off to the south. After a couple of seconds, he noticed that the airplane had slowed slightly, and he saw "the rear landing gear" come up. The nose of the airplane rose slightly, and the airplane "appeared to veer to the left (left wing dipped slightly)" followed by it slowing more as it began to lose altitude. The airplane impacted the ground, possibly with its left wing first, "but still pretty much a belly flop type landing." The airplane slid about 50 ft before it came to a stop and erupted into a "fireball." Video recordings obtained from two video cameras mounted on an airport building were used to estimate the speed of the airplane. The airplane's estimated ground speed during the last 5 seconds of flight was 71±3 knots. For further details, refer to the NTSB Video Study in the docket for this investigation. The pilot held an airline transport pilot certificate with airplane single-engine land, multi-engine land, and single-engine sea ratings, as well as a flight instructor certificate with single-engine, multi-engine, and instrument airplane ratings. He also held type ratings for CE-500, CE-560, and SA-227 airplanes. 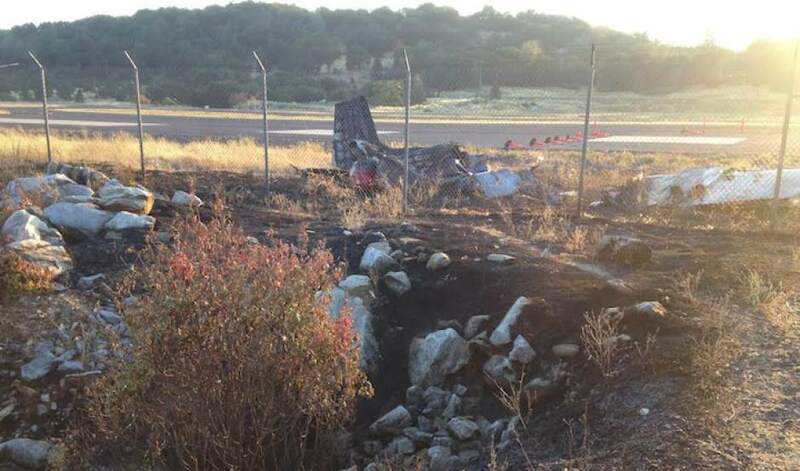 The pilot's personal flight logbooks were not located during the investigation. At the time of the accident, the pilot was employed as a pilot for an on-demand Part 91 Subpart K fractional ownership company. The pilot was issued a first-class airman medical certificate on May 18, 2016, with no limitations noted. On the application for this medical certificate, the pilot reported a total flight time of 12,000 hours of which 200 hours were accumulated in the previous 6 months. The five-seat, low-wing, retractable-gear airplane, serial number 35705, was manufactured in 1958. It was powered by two fuel-injected Continental IO-470 engines, serial numbers 50164-5-M (right), and 51603-7-M (left), each equipped with a McCauley three-bladed, constant-speed propeller. During the investigation, the aircraft, engine, and propeller maintenance records were not located. A review of FAA documents found that, according to the airplane's type certificate data sheet, the only engine approved to be installed on the aircraft was a Continental O-470-M engine. The type certificate data sheet also listed the approved propellers as either Hartzell HC82XF-2 or HC-A2XF-2. The FAA supplemental type certificate (STC) database was searched for STCs that would allow for the installation of fuel injected IO-470 engines and/or McCauley propellers on the airplane. The search revealed STC SA2-1578 that was issued to Bendix Corporation for the installation of Teledyne Continental Motors O-470-BI or O-470-MI engines modified for fuel injection on Cessna 310, 310A, 310B, and 310C airplanes. The search also revealed STC SE2-1577 that was issued to Bendix Corporation for the installation of Bendix RS-5BD1 or RSA- 5AD1 fuel injection systems on Continental O-470-B, O-470-M, O-470-H, and O-470-N engines. Additionally, a search of the airplane's FAA airworthiness file found no records regarding the installation of these STCs on the airplane. Further, FAA Form 337 for the installation of these STCs as they are a major repair, were not found during the investigation. Also, an STC for the installation of the McCauley propellers was not located. At 1655, the weather reporting facility located at O22 indicated wind from 290° at 7 knots, visibility 10 statute miles, temperature 40°C, dew point 3°C, and an altimeter setting of 29.92 inches of mercury. The airport elevation for O22 is 2,121 ft mean sea level. The density altitude at the time of the accident was calculated to be 5,483 ft. 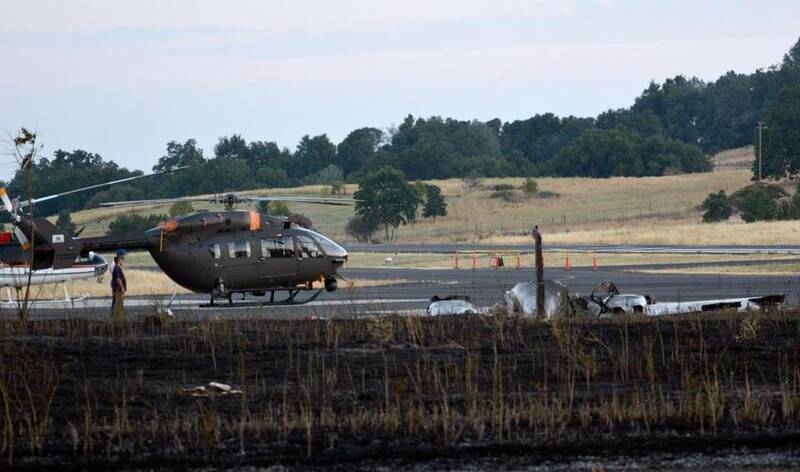 The initial impact point was in a gravel area between the main ramp and a helicopter ramp. The wreckage path led from the initial impact point on a magnetic heading of 158° to the main wreckage, which was located just before the paved surface of the helicopter ramp. Two sets of slash marks were noted in the wreckage path consistent with strikes by the left and right propellers. The fuselage came to rest on a magnetic heading of 194°. As the airplane came to rest, the right engine nacelle stuck the rear of a parked fuel truck. Postimpact fire consumed a majority of the fuselage and the wings inboard of the engine nacelles. The fuselage was consumed from the forward cabin bulkhead to aft of the cargo compartment. 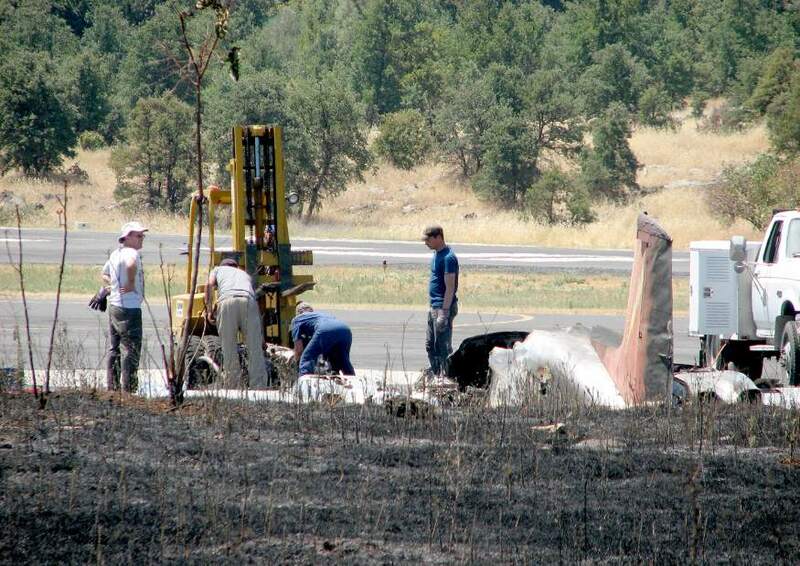 The empennage exhibited some heat damage but remained intact with minimal impact damage. The outboard section of the right wing had minimal damage with one area of crushing of the leading edge about 2 ft inboard from the tip. The left wing exhibited upward crushing from the tip inboard to the nacelle. The left and right fuel tip tanks both separated from the wings during the impact sequence. The left engine remained attached to its wing by a portion of the engine mount. The throttle, propeller, and mixture cable rod ends were observed attached to their respective control levers. The left propeller hub had separated from the crankshaft flange and came to rest forward of the main wreckage. All three blades remained attached to the hub and exhibited chordwise scratches, gouging and curling. The right engine remained attached to the wing at the engine mounts. The right propeller remained attached to the crankshaft flange. All three blades remained attached to the hub and exhibited gouging, chordwise scratches, and curling. All the flight controls were attached to their respective attach points. Flight control continuity was established from the flight control surfaces to the cockpit with the exception of a 1-ft section of unidentified cable that was embedded in molten metal from the postimpact fire. The flaps were found in the fully retracted position. The landing gear was found in the retracted position. Both fuel selector valves were noted to be in the "main tank" position. The glass containers of both fuel strainers were intact; the fuel strainer screens exhibited thermal damage but appeared to be clear of debris. Fuel was noted in the auxiliary tanks. The elevator trim tab was measured at 15° trim tab down. The rudder trim tab was streamlined. The aileron trim tab was measured at 5° tab down. Both engines were shipped to the Continental Motors facility in Mobile, Alabama, for teardown examinations. Before the teardown of the left engine, crankshaft and camshaft continuity were confirmed during a cylinder thumb compression test. The teardown examination did not reveal any preaccident anomalies with any of the internal engine components. Disassembly of the fuel pump did not reveal any preaccident anomalies that would have precluded its ability to pump fuel. The throttle body/fuel metering unit and the fuel manifold valve/fuel injector nozzles were flow tested on the production test stands in the as-received condition without any adjustments. The magnetos were placed on a test stand, and both produced a spark from each of their ignition leads in firing order with no preaccident anomalies noted. Before the teardown of the right engine, crankshaft and camshaft continuity could not be confirmed because the crankshaft would not rotate. The left side crankcase was fractured near the No. 5 main bearing, and the bearing was slightly displaced. The fracture appeared to be irregular in shape and fresh and was consistent with impact damage. There were no signs of operational distress on the No. 5 main bearing or No. 5 main crankshaft journal. The teardown examination did not reveal any signs of pre-accident operational distress. Due to thermal damage sustained by the fuel system components, teardown inspections of these components were conducted; no preaccident anomalies were noted with any of the components. The magnetos were placed on a test stand, and both produced a spark from each of their ignition leads in firing order with no preaccident anomalies noted. 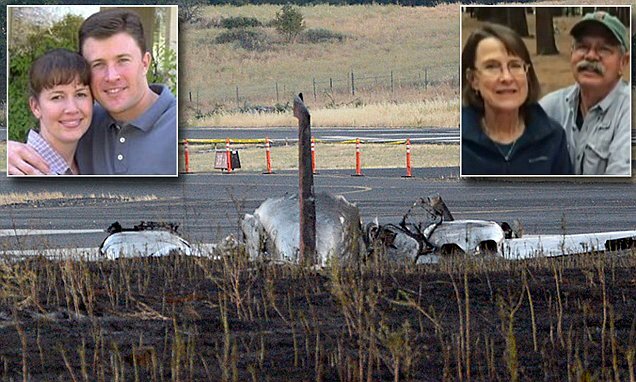 The Tuolumne County Office of the Coroner, Sonora, California, conducted an autopsy on the pilot. The medical examiner determined that the cause of death was asphyxia due to inhalation of smoke and fumes. The FAA's Bioaeronautical Sciences Research Laboratory, Oklahoma City, Oklahoma, performed toxicology tests on the pilot. According to the toxicology report, a 34% concentration of carbon monoxide was detected in blood, and 1.96 us/ml cyanide was detected in blood. No ethanol or drugs were detected by the testing. Carbon monoxide and cyanide in the blood can result from inhalation of smoke and fumes during a fire. According to a Federal Aviation Administration airworthiness inspector assigned to this accident who examined both engines at the accident site, the inspector reported that both O-470M engine's fuel system had been modified by removal of OEM Bendix PSD-5C pressure carburetors, and installation of TCM continuous flow fuel injection systems. Engine TCDS E273 allows this mod under note 6, [which] requires re-marking the data plates as O-470M(CI). This re-identification was not found on the data plates of either engine. The Cessna 310B TCDS 3A10 shows only the O-470M as the only approved engine and does not include the O-470M(CI). The Continental Continuous Flow fuel injection system Drawing Eq. No. 5580 requires that the engine driven pump be replaced with one of a higher pressure rating than the OEM Bendix pressure carburetor requires. This would necessitate that the airframe mounted fuel boost pumps would require replacement with later model pumps that delivered a higher pressure rating required for later model C310 aircraft equipped with TCM continuous flow fuel Injection. This aircraft would require a 337 field approval for such conversion and installation of O-470(CI) continuous flow engines in this aircraft. Records revealed no such Field Approval 337 forms on file for such an alteration. Additionally, as there were no maintenance records located during the investigation, it could not be determined when or by whom the engine modifications were performed. During the investigation, it was reported by the FAA's Aircraft Certification Office, Atlanta, Georgia, that after an exhaustive search for documentation relative to the airplane's revised performance data, which would have been published subsequent to the approval of the fuel injection system modification, that documentation could not be located. On July 27, 2016, about 1645 Pacific daylight time, a twin-engine Cessna 310B airplane, N6605B, sustained substantial damage following a loss of control during takeoff at the Columbia Airport (O22), Columbia, California. The pilot and three passengers sustained fatal injuries. The airplane was being operated by the pilot as a personal cross-country flight under the provisions of Title 14 Code of Federal Regulations Part 91. Visual meteorological conditions prevailed and no FAA flight plan was filed. Witnesses stated that they saw the airplane taxi onto runway 17 for departure. During the initial climb, about 40 feet above ground level, the airplane stopped climbing and started drifting to the left. 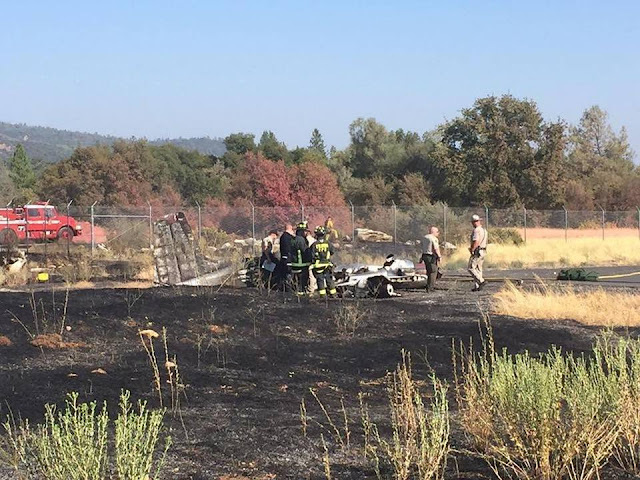 The witnesses said that the airplane then descended and impacted off the left side of the runway near the general aviation ramp and immediately burst into flames. The initial point of impact was located at the southwest corner of the airport parking ramp, just off the paved surface. 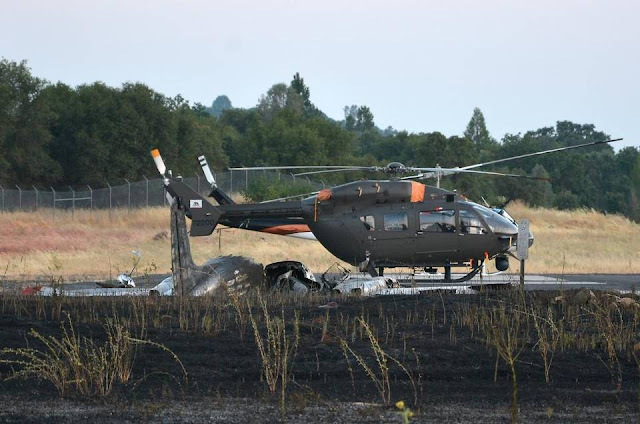 From the initial point of impact, the airplane traveled on a 172 degree magnetic bearing about 250 feet before coming to rest at the north edge of the helicopter parking area. All major components of the airplane were located in the debris path. 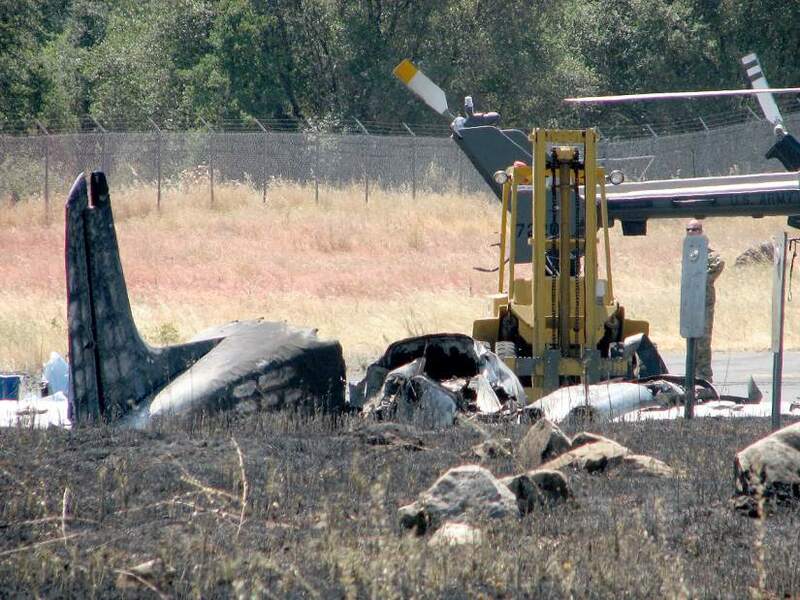 A majority of the airplane fuselage was consumed by the post-impact fire. The airplane was powered by two Continental Motors O-470 engines, that had been modified by the addition of a fuel injection system. A detailed examination of the engines are pending.